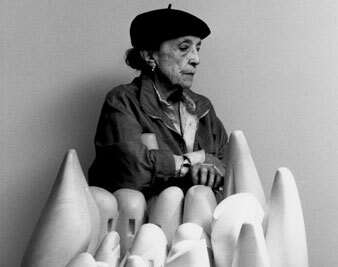 The Louise Bourgeois retrospective at the Guggenheim. “Full recognition came late to Louise Bourgeois”–so wrote Peter Campbell of The London Review of Books when her vast retrospective, which has now moved to the Guggenheim (through September 28), opened at Tate Modern in London last fall. It’s the same thing nearly every reviewer said, and it’s what I’d always heard about Bourgeois’s work from the moment I became aware of it more than twenty years ago. I suppose the validity of that judgment depends on just how “full” recognition has to be before it becomes full enough as well as how soon it comes before seeming late. But by most reasonable standards, the received tale of Bourgeois’s belated recognition is exaggerated. It’s true that Bourgeois, after exhibiting regularly starting in the mid-1940s, took a long and unexplained hiatus: she did not have a solo show for the eleven years before 1964, by which time she was already 53 years old. But when she was ready to come back it was as a well-known figure with works already in the collections of the Whitney and the Museum of Modern Art. Her 1964 exhibition was favorably received by critics. Two years later Lucy Lippard featured her in Eccentric Abstraction, an important exhibition accompanied by a still often-cited essay in the magazine Art International, casting her as the mother figure to a rising generation of post-minimalist sculptors like Eva Hesse and Bruce Nauman; Lippard had been a student of Bourgeois’s husband, the art historian Robert Goldwater. From then on Bourgeois’s work was shown often; she received an honorary degree from Yale in 1977, among other laurels, and had her first retrospective at MoMA in 1982–shockingly, the first for any woman artist there. Well, in an era when Frank Stella could have a MoMA retrospective at 34, Bourgeois having to wait until her seventy-first year does seem a bit much; but another way to look at it is to say that it took Bourgeois just eighteen years after her return to the gallery scene to achieve this–not bad. From 1964 on–and despite the fact that her work was clearly out of step with prevailing styles such as Pop, Color Field, Minimal and Conceptual art–her work was recognized and rewarded. And from the late ’60s on, she was also active in a nascent alternative to the mainstream gallery/museum world, the women’s art scene that has recently been celebrated in such exhibitions as Global Feminisms at the Brooklyn Museum and WACK! Art and the Feminist Revolution at LA MoCA and P.S. 1. “My feminism expresses itself in an intense interest in what women do,” Bourgeois has said, adding, “but I’m a complete loner.” At once a joiner and an isolato, Bourgeois was probably the first woman artist to achieve worldly success in good part through solidarity with other women rather than as an exceptional woman among men. That kind of success had to come (relatively) late to Bourgeois because it needed more than a decade of second-wave feminism to make it possible. And the enthusiasm that Bourgeois’s work has increasingly generated in the quarter-century since the MoMA show is in good part the enthusiasm of women (and of men who are sympathetic to feminism) who see in Bourgeois’s success a symbol of their own achievement, and in the acclaim she’s received, a recognition of their own struggles. All interpretation of Bourgeois’s work since 1982 has been rooted in “Child Abuse” and then in the many writings and interviews in which she has subsequently elaborated the tale. Not only Bourgeois’s words but also her imagery were becoming more explicit at this time. One reason 1982 was not too late but rather the right time for Bourgeois’s first retrospective is only clear in retrospect: she was just becoming the Bourgeois we think of today. Her sculpture of the ’50s through the ’70s was mostly abstract, though with ever more vivid corporeal evocations; but since then it has become much more figurative, as well as making more and more use of real objects–furniture, clothing and so on. Both her large-scale installations, such as the series of “Cells” she began in 1989, and the more intimate and vulnerable fabric sculptures she’s been doing since the ’90s–bodies of work that now seem most typical of Bourgeois–have developed only in the past two decades. But devouring the father, as Freud suggested in Totem and Taboo, turns out to make him stronger than he had been when alive. Bourgeois keeps feeding artistically on her ancient wounds, as if living off a capital that pays out unlimited interest. It’s the viewer who is challenged to “accept or abandon” complicity in this never-ending psychodrama. Yet all the more impressive is the sheer relentless form-giving energy that Bourgeois never stops drawing from all this unsavory material. No other contemporary sculptor could present such a range of accomplishments: works in every scale from minute to monumental, materials ranging from traditional bronze and marble through the funky alternatives of the ’60s like latex and plaster to the cloth she has used so much in recent years; techniques of carving, modeling and assembling, using forms that range from rough-hewn geometry to broadly figurative through biomorphic abstraction, presented as self-contained objects, in groups, or as contained within architecturally scaled environments; and all this tackled with a passionate commitment beyond mere eclecticism. One can’t help think: major artist. And the exhibition gives only glimpses of her massive oeuvre in drawing and prints. It’s impossible not to be impressed. But exhilarated? Not really. The past weighs too heavily on this art; the voyeuristic fascination with memories of childhood suffering that it invites makes it a multifarious monument to its own impasse. She dotes on her father’s misconduct, really, and rightly so, for it’s given her matter for an incomparably rich and fruitful life in art, but I can’t help feeling a bit queasy amid the sculptural offspring of this strange family romance.